One of the biggest objections to the Iran Nuclear Deal is that it violated U.S. law because it was never approved by two-thirds of the Senate, as required by the “Treaty Clause” (Art. II, Sec. 2) of the U.S. Constitution. (Contrary to the beliefs of many red-blooded Americans, the Constitution gives ratified treaties the same force as domestic law, per the Supremacy Clause.) However, this reflects a fundamental misunderstanding of the deal, the Constitution, and international law. First, the deal was never binding: It is classified as a “nonbinding political commitment”, which, by definition, and in contrast to a treaty, requires no congressional approval nor is legally binding. Throughout U.S. history, presidents of all parties have made international agreements without the approval of a supermajority of Senators, either through “congressional-executive agreements”—which are ratified by only a simple majority of Congress—or through “executive agreements”, which are made solely by the president without any congressional involvement. While the Constitution does not explicitly provide for these alternatives, these alternatives have long been considered legitimate. Thomas Jefferson, a globalist sellout if we ever saw one, argued that the Treaty Clause procedure is not always necessary; short-term agreements without Senate approval may be better since “when they become too inconvenient, [they] can be dropped at the will of either party”. Most of the Founders did not objective this, because they recognized pragmatic and expedient reasons to allow the president to make international agreements without going through the long and politicized channels of the legislature. In fact, when Jefferson sought to purchase the massive Louisiana Territory from France, there was some debate as to whether expanding U.S. territory was legal, since the Constitution was silent on the matter. He ultimately prevailed on the argument—backed by the “Father of the Constitution” James Madison—that the executive’s broad foreign policy powers allowed him to acquire the territory through treaty; he subsequently signed an agreement with France in April, announced it publicly in July, and finally got it ratified by the Senate in October. According to polls of international relations (IR) experts and the American public, the U.S. is believed to have far less global respect than in the past. Among the foreign affairs experts, 93% say the U.S. is less respected by other countries today compared with the past, according to a survey of international relations (IR) scholars conducted in October 2018 by the Teaching, Research and International Policy (TRIP) Project at the College of William and Mary. The poll included 1,157 respondents who are employed at a U.S. college or university in a political science department or professional school and who teach or conduct research on international issues. Only 4% of these experts believe the U.S. is as respected as in the past, with a mere 2% saying the U.S. gets more respect from abroad than it has previously received. 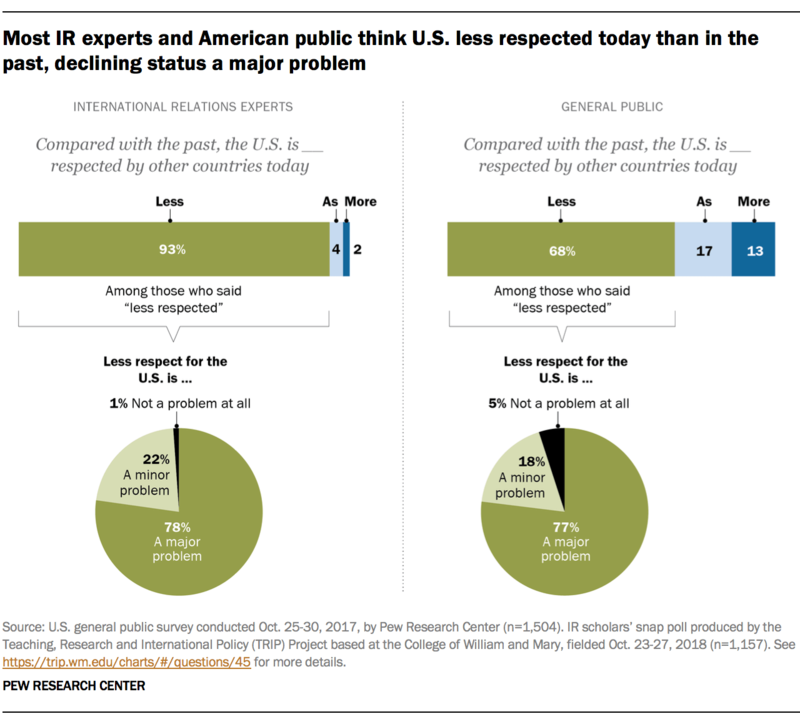 The American public also has seen a decline in other countries’ respect for the U.S., though it is less unified than IR experts in its assessment, according to a separate survey of 1,504 adults conducted in October 2017 by Pew Research Center. Roughly seven-in-ten Americans (68%) said the U.S. is less respected by other countries today compared with the past. About two-in-ten (17%) thought America had maintained its global level of respect, while 13% said the U.S. is more respected. It should be noted, however, that a majority of the American public has expressed belief that the U.S. is less respected every time the question has been asked since 2004, ranging from a low of 56% to a high of 71% holding this opinion. Moreover, the majority of those who said the U.S. is less respected (around three quarters) believe this is a major problem. Among the public overall, there are sharp partisan differences over whether the U.S. is less respected today than in the past and whether it’s a major problem. Around four-in-ten Republicans and Republican-leaning independents (42%) asserted in the 2017 survey that the U.S. is less respected than in the past, and about a quarter (28%) deemed this a major problem. 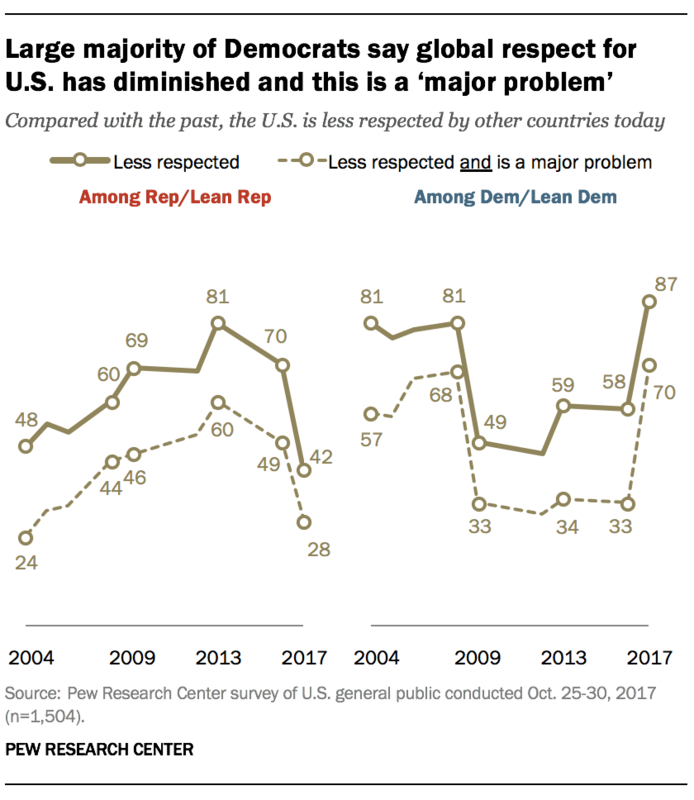 Yet more than twice as many Democrats and Democratic leaners (87%) thought global respect for the U.S. had diminished, and seven-in-ten said this is a major problem. 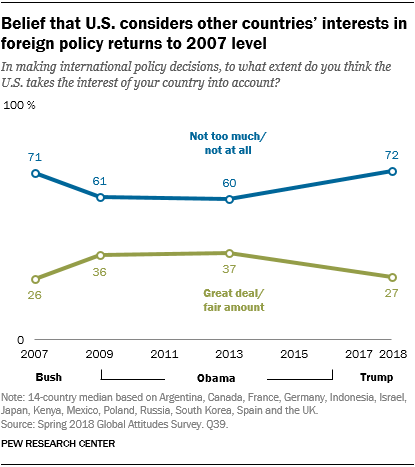 While majorities of Democrats viewed the U.S. as less respected internationally at various points during the Obama administration, there was a 29-percentage-point increase in the share saying this between 2016 and 2017 following Donald Trump’s election. Similarly, the share of Republicans saying that the U.S. is less respected abroad dropped by 28 percentage points from the end of the Obama administration to when Trump took office. Many Americans may not think this matters, given that the U.S. remains a powerful country militarily, economically, and even culturally. But with the balance of power shifting across several different countries and regions, and global problems like terrorism and climate change warranting more international cooperation, having the rest of the world on your side is more crucial than ever. We need allies and partners, whether for trade, scientific research, economic development, or military defense. That will be a lot harder to achieve if we keep alienating ourselves from the rest of the world, while rivals and emerging powers fill in the gaps. On this day in 1969, the U.S. launched Apollo 8, the second manned spaceflight mission in the Apollo space program and the first crewed launch of the Saturn V rocket. Astronauts Frank Borman, James Lovell, and William Anders became the first humans to travel beyond low Earth orbit, see all of Earth, orbit another celestial body, see the far side of the Moon, witness and photograph an “Earthrise” (first photo), escape the gravity of another celestial body (the Moon), and reenter Earth’s gravitational well. Apollo 8 was also the first human spaceflight from the Kennedy Space Center, located adjacent to Cape Canaveral Air Force Station in Florida. Originally planned as a test of the Apollo Lunar Module, since the module was not yet ready for its first flight, the mission profile was abruptly changed in August 1968 to a more ambitious flight to be flown in December. Thus, the crew led by Jim McDivitt crew, who were training Apollo Lunar Module, instead became the crew for Apollo 9, while Borman and his men were moved to the Apollo 8 mission. This meant the new Apollo 8 crew had two to three months’ less training and preparation than originally planned, not to mention having to take up translunar navigation training. The crew themselves believed there was only a 50% chance of the mission succeeding. Fortunately, things went off without a hitch: after almost three days, Apollo 8 reached the Moon. The crew orbited the Moon ten times in 20 hours, during which they made a Christmas Eve television broadcast in which they read the first ten verses from the Book of Genesis—at the time the most watched TV program ever. (In fact, it is estimated that one out of four people alive at the time saw it either live or shortly after.) Even the Chairman of the Soviet Interkosmos program was quoted describing the flight as an “outstanding achievement of American space sciences and technology”. Although largely forgotten today, Apollo 8 was seen as the joyful culmination of a tumultuous year, rife with political assassinations, instability, and other tragedies worldwide. For a moment, humanity received a well needed morale boost. the success of the mission paved the way for Apollo 11 to fulfill America’s goal of landing a man on the Moon before the end of the 1960s. The Apollo 8 astronauts returned to Earth on December 27, 1968, when their spacecraft splashed down in the northern Pacific Ocean. They were later named TIME’s “Men of the Year” for 1968. The iconic Earthrise photo has been credited as one of the inspirations of the first Earth Day in 1970; it was selected as the first of Life magazine’s 100 Photographs That Changed the World. More than one in three people (37%) could not name a single right protected by the First Amendment. Only one in four (26%) can name all three branches of the government (down from 38% in 2011), and one in three (33%) cannot name any branch of government. A majority (53%) believe that undocumented immigrants have no rights under the Constitution, despite the Supreme Court ruling repeatedly that everyone in the U.S. is entitled to due process and the right to make their case before the courts. Take this Pew Research Center poll from 2010 When asked to name the chief justice of the Supreme Court, less than three in 10 (28%) correctly answered John Roberts. That compares unfavorably to the 43% who rightly named William Rehnquist as the chief justice in a Pew poll back in 1986. What did the 72% of people who didn’t name Roberts as the chief justice in 2010 say instead, you ask? A majority (53%) said they didn’t know. Eight percent guessed Thurgood Marshall, who was never a chief justice of the Court and, perhaps more importantly, had been dead for 17 years when the poll was taken. Another 4% named Harry Reid, who is not now nor ever was a Supreme Court Justice.What we don’t know about the government — executive, legislative and judicial branches — is appalling. It’s funny — until you realize that lots and lots of people whose lives are directly affected by what the federal government does and doesn’t do have absolutely no idea about even the most basic principles of how this all works. The level of civil ignorance in the country allows our politicians — and Donald Trump is the shining example of this — to make lowest common denominator appeals about what they will do (or won’t do) in office. It also leads to huge amounts of discontent from the public when they realize that no politician can make good on the various and sundry promises they make on the campaign trail. While I think more and better civics curricula is a solution, I also suspect that the visceral hatred of all things government dissuades people from caring about these things in the first place. At the same time, I can also see how (often understandable) cynicism towards our political system might breed apathy, too. Why bother to know about a system that you are convinced does nothing good for you or society? Before the emergence of the political units we now call countries, humans organized themselves in a variety of other ways, ranging from bands and tribes, to chiefdoms, kingdoms, and empires. Most of these entities were not proper countries as we think of them today, lacking a cohesive political or national identity, a firm boundary, or much in the way of an organized government. The ancient societies of Egypt, Greece, China, Mesoamerica, the Indus River Valley, and Mesopotamia were among the exceptions, which is why they are recognized as “cradles of civilization”, places where the first features of what we consider modern society emerged: agriculture, urban development, social stratification, complex communication systems, infrastructure, and so on. The urban character of civilization is what I find most interesting, because cities were where power, both political and economic, was concentrated. Urban centers were the places from which rulers asserted their authorities. Cities are where democracy and republicanism took root, and where civic engagement survived through the Middle Ages in places like Florence, Venice, Krakow,and Hamburg. This dynamic has changed little in the 21st century; in fact, it is arguably stronger and more pronounced than ever, as globalization, population growth, and advanced technology come together to create metropolises as populous, wealthy, and powerful as entire countries. The following map, courtesy of CityLab, draws on data from 2015 to prove the incredible growth and prestige of modern cities (the data for cities comes from the Brookings Institution’s Redefining Global Cities report, while the data for nations is from the World Bank’s World Development Indicators; the map was compiled by Taylor Blake of the Martin Prosperity Institute). Tokyo, the world’s largest metro economy with $1.6 trillion in GDP-PPP, is just slightly smaller than all of South Korea. Were it a nation, Tokyo would rank as the 15th largest economy in the world. New York City’s $1.5 trillion GDP places it among the world’s twenty largest economies, just a tick under those of Spain and Canada. Los Angeles’ $928 billion GDP is bit smaller than Australia’s, with $1.1 trillion. Seoul ($903 billion) has a bigger economy than Malaysia ($817 billion). London’s $831 billion GDP makes its economic activity on par with the Netherlands ($840 billion). Paris, with $819 billion in GDP, has a bigger economy than South Africa, $726 billion. The $810 billion economy of Shanghai outranks that of the Philippines, with $744 billion. 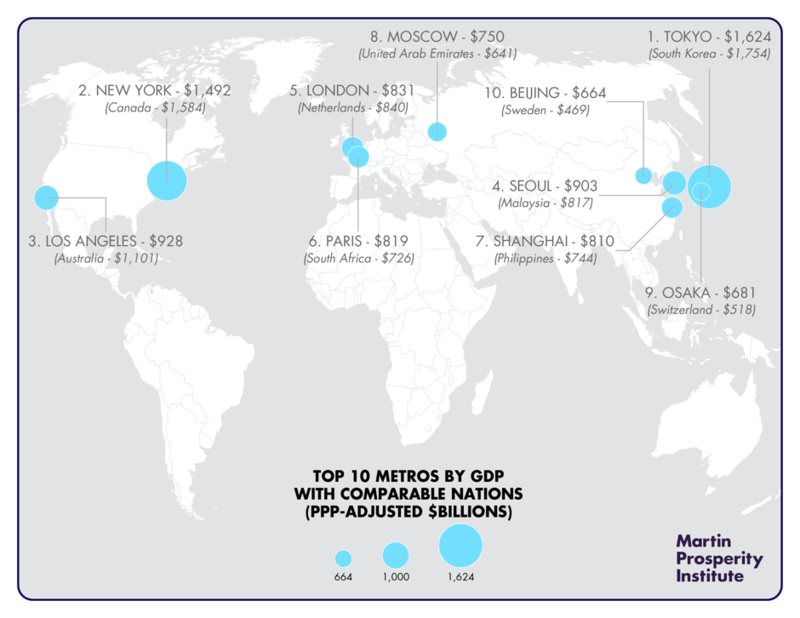 To put things in further perspective: if you added up the ten largest metropolitan areas, you’d get an economy of over $9.5 trillion, bigger than the Japanese and German economies combined. Add the next ten largest metros, and you get the second largest economy in the world, at $14.6 trillion, less than four trillion shy of the U.S. In other words: Cities really are the new power centers of the global economy—the platforms for innovation, entrepreneurship, and economic growth. But when it comes to fiscal and political power, they remain beholden to increasingly anachronistic and backward-looking nation-states, which has become distressingly obvious with the rise of Trumpism in the United States and populism around the world. The greatest challenge facing us today is how to ensure that global cities have the economic, fiscal, and political power to govern themselves and to continue to be a force for innovation and human progress. Very relevant question as the balance of power both within and between countries shifts to certain global cities, especially in the developing world. Trachoma, the leading infectious cause of blindness in the world, is spread by flies and human touch, and is linked to poverty and lack of access to clean water and sanitation. It starts as a bacterial infection and, if left untreated, causes the eyelashes to scratch the surface of the eye, causing great pain and, potentially, irreversible blindness. In 2000, about 2.8 million people in Ghana were estimated to be at risk of the disease but the World Health Organization (WHO) has now officially recognised that the country has eliminated it. Thanks to these efforts,Ghana now joins six other countries where trachoma is endemic — Oman, Morocco, Mexico, Cambodia, Laos, and Nepal — that have eliminated the disease. Nevertheless, trachoma still remains a significant global problem: over 200 million people across 41 countries (mostly in Africa) are at risk of infection. Ghana and several other nations have shown the way. Here is hoping more health agencies, pharma companies, and charities take note. The Most Dangerous Profession in the World? The only thing authoritarians hate more than a free public is a free press, given that the latter can help arm the former with knowledge and impetus to push back. But as “fake news” goes from being an American meme to a global phenomenon, despots worldwide are taking note, invoking it in their familiar but growing crackdown on reporters and journalists. The annual prison census, carried out by the nonprofit Committee to Protect Journalists (CPJ), found at least 251 journalists languishing in prison on Dec. 1, 2018, the third consecutive year at roughly that level. But of those 251, a record 28 were behind bars on charges of “false news,” a big spike from just two years ago, when there were nine such cases. Egypt accounted for the most cases of journalists jailed for so-called false news, with 19 behind bars. There were four in Cameroon, three in Rwanda, and one each in China and Morocco. The report pointed the finger at Trump as “the leading voice” fueling global rhetoric about fake news. “You think #FakeNews rhetoric doesn’t have consequences?” tweeted the report’s author, CPJ’s editorial director Elana Beiser. It also noted that while no journalists are imprisoned in the U.S., reporters there faced fatal violence and hostile rhetoric. In June, five people were killed in a mass shooting at the offices of The Capital Gazette in Annapolis, Maryland, and a mail bomber who embraced Trump’s media attacks sent threatening packages to CNN headquarters, among other places, in October. It’s the third year running that the number of reporters behind bars has topped 250 — a stat that suggested that “the authoritarian approach to critical news coverage is more than a temporary spike,” and had become “the new normal,” according to Beiser. The report found the high numbers had been sustained by renewed crackdowns in China, Egypt, and Saudi Arabia, which, along with Turkey and Eritrea, were the five leading jailers of journalists. Turkey, China, and Egypt alone accounted for more than half the world’s jailed journalists for the third year in a row. The report found that nearly three-quarters of jailed journalists were facing anti-state charges, such as supporting groups deemed to be terrorist organizations, and the vast majority — 98 percent — were jailed by their own governments. Considering that the balance of power is shifting to the developing world, most of all China, the normalization of constraining a free press sets a very concerning precedent. But when even the ostensible leader of the free world has embraced hostile rhetoric towards media, it is unlikely that this problem is going away any time soon — even though the need for a free press is more important than ever. Modern-day Estonia has become synonymous with the notion of reimagining how citizens interact with their government, making nearly every governmental service available from home or on the go via a mouse click. Since 2005 the country has allowed its citizens to cast their votes in pan-national elections via a secure online portal system, growing to over 30% of votes cast in the last several elections, according to Tarvi Martens, Chairman of the Estonian Electronic Voting Committee. Citizens can vote as many times as they like up to election day, with only the final vote counting. Those who do not have access to a computer or who prefer old fashioned paper ballots can still vote by paper – evoting is an option rather than a mandate. Interestingly, nearly a quarter of evotes in recent elections have been cast by people over the age of 55, with another 20% of evotes from the 45-54 age range. This suggests evoting enjoys broad support not just among young digital native millennials, but across the societal spectrum, especially among those who, at least in the US, are not typically viewed as early adopters of digital services. To vote in Estonia, one simply visits the national election website and downloads and installs the voting application. Then you insert your national identity card into your computer’s card reader, fill out your digital ballot, confirm your choices and digitally sign and submit your eballot. You can do all of this from the comfort of your own home in the seven days leading up to election day. Pretty amazing stuff, especially for a country that still largely relies on woefully outdated tech to cast its votes. Granted, with cybersecurity being one of the penultimate concerns of 21st century technology, lots of skeptics would be right to question whether something like voting is yet another activity that should be put in the realm of potential hackers. But Estonia seems to have addressed this issue, too. Of course, one of the most common concerns regarding internet voting is the potential that one’s vote could be changed either by a virus on your computer or as your ballot transits the internet on its way to the central government servers. To address this, Estonia’s evoting system adds a novel twist: the ability to use your mobile phone to separately connect to the electoral servers via a different set of tools and services to see how your vote was recorded and verify that it is correct. After casting your vote using your desktop computer you can thus pull out your smartphone and verify the results that were actually received by the central electoral servers. The results are encrypted so that no government official can see how you individually voted, only you can see your individual voting choices, even as they are aggregated into the national totals. By physically separating vote casting and vote checking to two different devices (votes are cast via a desktop computer, while checking your vote must be performed on your phone), it makes it highly unlikely that even the most motivated attacker could compromise both devices in such a way that your vote could be changed without your knowledge. And of course, even after voting online, you can always show up at a polling station on election day and vote via paper ballot if you want. I think this is perfectly doable in the U.S., at least on a technical level; constitutionally, every state handles voting its own way, so whether we can implement a nationwide standard of e-voting remains to be seen. But if even a handful of states give it a try, it might set a good example and get the ball rolling. It never ceases to amaze me how well connected and globalized the ancients were. We think of globalization as a thoroughly modern phenomenon, yet the seeds of it were planted centuries or even millennia ago, where global connections would have seemed impossible. Visit Mantai, nestled into a bay in northwestern Sri Lanka, and today you’ll see nothing but a solitary Hindu temple overlooking the sea. But 1500 years ago, Mantai was a bustling port where merchants traded their era’s most valuable commodities. Now, a study of ancient plant remains reveals traders from all corners of the world—including the Roman Empire—may have visited or even lived there. Mantai was a hub on the ancient trade networks that crisscrossed the Indian Ocean and connected the distant corners of Asia, Africa, Europe, and the Middle East. The port town flourished between 200 B.C.E. and 850 C.E. During that time, it would have been a nexus for the spice trade, which ferried Indonesian cloves and Indian peppercorns to Middle Eastern and Roman kitchens. The team also found remains that could link the port city to the ancient Mediterranean world—processed wheat grains dated to 100 to 200 C.E. and grape seeds dated to 650 to 800 C.E. Neither crop can grow in Sri Lanka’s wet, tropical climate, so they had to be imported, possibly from as far as Arabia or the Roman world. Kingwell-Banham says her team is studying the chemical isotopes absorbed by the plants to determine where they were grown. But no matter their precise origin, the coexistence of rice and wheat is evidence of Mantai’s “cosmopolitan cuisine,” in which both local and foreign foods were eaten, she says. The discovery of wheat and grapes in Mantai “is entirely new,” and shifts the focus on goods transported from South Asia to the Roman world, to goods that went in the other direction,” Coningham says. While there is no evidence that Roman merchants or other travelers lived in what is today Sri Lanka, it is certainly not out of the realm of possibility: just a few years ago, remains were unearthed in London that appear to be of Chinese origin — and date back to between the third and fifth centuries C.E., when it was the Roman city of Londonium. Russia and China are the only countries to have their own social media platforms be more popular than an American one: V Kontakte and Odnoklassniki (part of “Russia’s Google”, Mail.ru) and QZone (owned by China’s tech giant, Tencent, the world’s largest gaming and social media company). However, China bans most U.S. platforms, and only Russia’s are popular abroad (albeit in the Russian-speaking former Soviet bloc). Otherwise, Facebook is very clearly the leading social network by a wide margin, dominating 152 out of 167 countries analyzed (91% of the planet).